​Thank you for your interest in supporting Paws 4 Autism. The generous donations from individuals, service clubs, businesses, foundations, and bequests ensure that we can continue helping our community by providing certified service, facility, social, therapy, reading and comfort dogs. We do not receive any government funding for our programs. With your gift, you are making an investment in developing an extraordinary life-long, human-animal partnership and team. There are a variety of interactive relationships that develop through PAWS trainers, volunteers and disability experts to make the perfect match for a recipient whether it be a service dog placed with a child, a facility dog with a professional or a social therapy dog placed with a volunteer. Every dollar donated is leveraged through our corporate and community partnerships, volunteers, puppy raisers and others to maximize the services we provide for those in need. Paws 4 Autism is a 501(c)(3) nonprofit, 100% volunteer organization. ​FOSTER FAMILIES - our growth is only limited by the number of foster families helping to raise our pups! 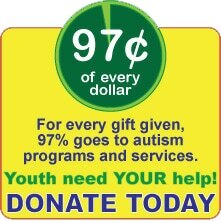 Shop online through smile.amazon.com and designate Paws 4 Autism as your charity. Add the search engine powered by Yahoo! from GOOD SEARCH to your web browser tool bar. Designate PAWS4AUTISM as your charity and earn donations to enhance lives through independence each time you search the web!